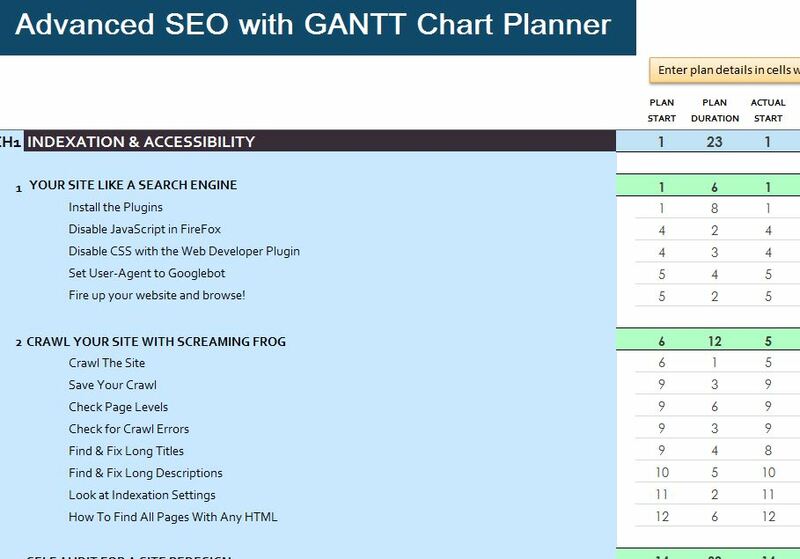 The Advanced SEO with GANTT Chart Planner is made available to any user. Just click the link at the bottom of this page to get started in your journey to better SEO. To the left of the template page, you will find a list of SEO related topics. These will be your various projects that you’ll use to improve your content. You can add or change any of the items by clicking the cell and adding something new instead. Now, go through the list and use the categories to find the tasks you need to get started on. Once you determine you want to undertake a project, you will list the specifics of planning, starting, and ending that project in the middle section of the template. Simply list the day of the month you want to start and when you plan to finish it. Once you have completed the task, you will list that in the “actual” columns of the middle section as well. You can also use the graph section of the Advanced SEO with GANTT Chart Planner to give yourself a helpful visual of your progress. Just use the legend above the graph to learn what the colors mean in relation to your information. Now you can outline the details of your SEO projects on a single page.